When we started Rope Sole 10 years ago the aim was to be a, ‘drop in the ocean’, against the hopelessness we saw in Egypt. So we found Egyptian potters, artists, and artisans, set up the business and imported their wares. Many of you supported us and ( even though our particular drop only involved 4 containers of goods) now the Missionary led enterprise, South of the pyramids, which we bought from, is entirely run and owned by locals. Drops DO work! Last week we had such sad news from our adopted Egyptian family in Cairo that we asked God for another ‘drop’ opportunity. He is good like that….full of amazing ideas. Whilst bargaining for the usual garlic and tomatoes in the farmers market last week I spotted a lovely stall with beautifully packaged jams, olive oils and …a box..of whitish blocks..of SOAP! 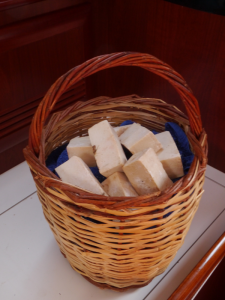 After the usual game of Anglo/ Greek charades and some dredged up English, I understood that the soap is entirely natural and hand made by the lovely Greek wife’s father. It is great for hair/skin/ feet/ even clothes…and also for leather…hey that means leather sofas too. My business card used to describe me as ‘ Merchant of Artisan Wares’ and that old self hove into view. Yesterday Simon and I went back to the market and explained the plan. To buy a panier full of this fab Greek soap and bring it back to the village. At the next Big Breakfast..November 16th by the way…we will have a basket and anyone who would like to support Maken and his family can make a donation in exchange for some great local Greek soap. Our new friend was so chuffed with the plan that he is going to give us a ‘special price’. One little village will be able to send a chunk of cash to a suffering little family in Egypt. Drops do work.